What Can I Do with an Online Doctorate in Social Work? Experienced social workers who enjoy mentoring colleagues should consider earning a Ph.D. in social work. A Ph.D. qualifies professionals to teach at the college level. These professionals also perform research in the field, ensuring that people who need social workers receive the best possible care. The Bureau of Labor Statistics projects employment for postsecondary teachers to increase 16% by 2026, significantly faster the average projected growth for all occupations. This guide covers the benefits of pursuing a Ph.D. in social work online, common career paths for graduates, and typical program requirements. There are numerous options for social work professionals who want to pursue further education in the field. Narrowing all those possible schools and programs down to a short list can be tough. Fortunately, our rankings can help. We have compiled a list of the best online PhD in social work programs, designed to help aspiring students find their perfect fit. After earning a bachelor’s degree in social work, graduates can pursue a master’s or Ph.D. in social work online. Many professionals earn a master’s to qualify for administrative positions within their organizations. Master’s programs typically emphasize management skills, such as finance and team leadership. Ph.D. students often plan to work in academic or research settings. Doctoral programs develop crucial research skills, and candidates for tenure-track professor positions must typically hold a Ph.D.
Another career path exclusive to Ph.D. holders involves developing government policy. As policy advisers, social workers influence how local, state, and federal governments fund and regulate social workers. Policy advisers can affect positive change for the entire profession. Professionals with an online Ph.D. in social work typically hold positions in academia before working as advisers. After earning a doctor of social work online, most graduates pursue careers related to postsecondary teaching and research. Graduates may begin their careers as professors before becoming department chairs or deans, both of whom can make significant changes to their institution’s social work curriculum. Deans also make decisions that impact all students’ academic experiences. Many social workers in these positions serve as policy advisers to government agencies or local social work organizations. Some Ph.D. graduates work in advisory roles full time. When selecting an online doctor of social work program, students should consider whether available courses and concentrations align with their career goals. Learners can compare the responsibilities of their desired position to each program’s curriculum and stated outcomes. Three common careers for professionals with an online Ph.D. in social work are licensed clinical social worker, postsecondary teacher, and social services consultant. These positions may have additional requirements beyond a Ph.D. Students should contact prospective programs to determine whether they prepare learners for specific careers. Licensed clinical social workers help people with mental disorders. They provide clients with medical, housing, and career resources. These social workers must hold a state license, which requires an advanced degree and at least 1,000 hours of supervised work experience. Postsecondary teachers work as lecturers and professors at colleges and universities. Typical job duties include mentoring students, developing curricula, and publishing academic research. Postsecondary teachers with doctorates can qualify for tenure-track positions. Social service consultants develop programs to help social workers improve care and outcomes for clients. Many consultants work for major social work agencies, while others are independent contractors. Social work salaries vary by industry, position, and geographic location. Overall, social workers who work for large institutions in major cities earn the highest salaries. Ph.D. graduates typically earn the most in managerial positions, such as university dean or senior research fellow. Because these positions require a Ph.D. and professional experience, many doctoral students work while earning their degree. In addition to providing experience and qualifying candidates for higher-paying positions, working while attending school demonstrates commitment to prospective employers. Most online social work Ph.D. programs use a format similar to other social science doctoral programs. During the first 2-3 years, students take multiple courses related to their concentration. Ph.D. programs also include specialized courses that teach students to plan, research, and write dissertations. Most programs require 45-60 credits beyond the master’s level. Many programs require students to maintain a minimum 3.0 GPA to remain in good academic standing. After completing coursework, students spend an additional 2-5 years writing a dissertation. The time required to complete a dissertation depends on factors including the student’s hypothesis, research project, and adviser feedback. Students may complete on-campus residencies to review their dissertation progress and defend their final draft in front of a dissertation committee. In this course, doctoral students learn to manage social work agencies and other large organizations. Learners identify improvement areas in organizations’ structures and develop social programs based on organizations’ capabilities. Students gain interpersonal and persuasive skills that social work leaders need to interact with community stakeholders and organizations. Learners analyze how successful social work campaigns use social and traditional media. Financial management courses teach students to create and follow budgets while meeting an organization’s social work goals. They analyze organizations’ budgets, identify problems, and propose solutions. Students examine how social work organizations promote messages using social media. Along with studying social media apps, learners prepare to perform data analytics to identify data trends. This course prepares students to work with people from all racial, cultural, and socioeconomic backgrounds. Students explore diversity and multiculturalism to better understand the needs of diverse communities. Learners also improve their self-awareness about privilege and its impact on their interactions. In contemporary issues courses, doctoral students study new challenges facing social workers and learn how to respond proactively. Students also learn how to influence policy to meet the evolving needs of communities. In programs that require a dissertation, students take a specialized course to plan and perform preliminary research under a professor’s guidance. Near the end of the course, students complete a short dissertation draft that includes multiple citations. Students use the draft as a foundation on which to build their full dissertation. Students in this course analyze how criminal activity degrades communities and how social workers can reverse these trends. The curriculum covers types of crime and steps communities can take to reduce criminal activity. Students prepare to work with law enforcement to develop and implement crime-reduction plans. Students attending accredited online doctoral programs in social work may complete one or more on-campus residencies. Residencies typically occur at the beginning, middle, and end of a program. During residencies, students often take specialized courses, collaborate with peers, perform research, and defend their dissertation. Students should contact their prospective program to learn about residency requirements. 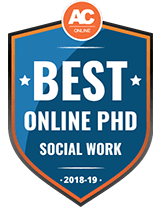 Many Ph.D. in social work online programs offer unique specializations like crisis intervention, policy practice, or social work administration. Completing a specialization may involve specialized coursework, field experiences, and an extensive research project. Nearly all online Ph.D. in social work programs require a dissertation, which can take up to five years to complete. The dissertation process begins with a specialized course during which students learn research and writing skills. With their professor’s help, learners select a topic and prepare a research study. After collecting data, students write and defend their dissertation. After a successful defense, candidates receive their doctorate. Instead of a dissertation, students may complete an extensive capstone project. During residencies, students refine their capstone topic, perform preliminary research, and present their project to professors and peers. A capstone project typically involves researching a challenge social workers face and proposing one or more solutions. During Ph.D. programs, students hone skills and competencies necessary for social work careers. Although curricula vary, most doctoral programs in the field emphasize the skills and competencies below. Social workers must act professionally and ethically when working with clients and directing staff. Students learn to maintain personal professionalism and to encourage other social workers to do the same. Social work Ph.D. candidates learn to create policy proposals unique to different racial, cultural, and socioeconomic groups. Ph.D. candidates must understand the role of justice and human rights in the actions of social work managers, professors, and policymakers. Students develop research skills during coursework and the dissertation process. Research plays a significant role in common careers for Ph.D. holders. Federal, state, and local policies affect social workers at all levels. Ph.D. candidates study policies relevant to their future careers. Students learn engagement skills through coursework in psychology and human behavior. Learners prepare to collaborate with people and communities in need. Graduates can pursue the licensed clinical social worker (LCSW) credential. Social workers with this license work in clinical settings, such as hospitals. LCSW candidates must pass the American Social Work Boards clinical exam and must have two years of supervised work experience under an LCSW. LCSW licensure requires only a master’s degree; however, a Ph.D. can lead to a higher starting salary and faster professional advancement. Licensure requirements and reciprocity agreements vary by state. Ph.D. graduates who work in academia do not need a license. However, many social work professors or policy advisers obtain licensure at some point in their career. Earning an LCSW and working as a licensed social worker can be a stepping stone toward other career goals. To qualify for either license, candidate must hold a degree from a regionally or nationally accredited online doctor of social work program. Although not required for licensure, attending a program with field-specific accreditation from the Council on Social Work Education can improve a graduate’s job prospects. Practicing social workers often join professional organizations that provide networking opportunities, discounts, and publications. Along with supporting professionals, these organizations assist undergraduate and graduate social work students. Student members often have access to exclusive scholarships, membership discounts, and career resources. Some organizations allow student members to participate in committees, leadership boards, and other decision-making bodies; these leadership roles help students gain experience and build a professional network. Some professional organizations support all social workers, while others focus on a social work specialty. Students and professionals should review a variety of organizations to find the options that best suit their needs and goals. NASW members receive access to resources including a career center, continuing education courses, and in-person networking through local chapter meetings. Student members pay a discounted membership fee. CSWE is an ideal organization for students planning to enter academia. Members receive access to teaching resources and materials for postsecondary educators. IFSW represents social workers and social work organizations in more than 100 countries. Members receive the IFSW journal, International Social Work, along with discounts on conference fees and invitations to participate in IFSW campaigns. SSWAA strives to improve social work services in U.S. schools. Students members receive a discounted membership rate, liability insurance, and grant opportunities. After graduation, SSWAA offers student members active membership at a reduced rate. This organization represents social workers who practice in rural, underserved communities throughout the United States. Student members receive all membership benefits, including publications on rural social work best practices and invitations to conferences.